Come and Have an AMAZing Time! Corn Maze III is nigh! Corn Maze III is hosted by the Shire of Abhainn Ciach Ghlais from November 4, 2016 at 4 PM to November 6, 2016 12 PM. The event takes place at Ard’s farm (4803 Old Turnpike Rd, Lewisburg, PA. 17837). “Several years ago, THL Angus McClerie and I were driving through ACG, and we drove by a corn maze. I said to Angus, “wouldn’t it be sweet to have some melees in there?” His response made my heart leap: “I went to High School with the owner”. “The first year, he told us we could have it for a few hours after he closed it on its last day before he plowed it under/harvested it. So we arranged for some construction lights, and at 8 pm on a Sunday night, with only three weeks notice, about 50 of us tromped through the maze with every goofy scenario we could come up with. Mostly they were traditional scenarios with a maze twist thrown in. “The site is a corn maze of about 10 acres. In the middle of the maze is a bridge that we allow spectators to stand on and watch the fighting happening all around them; they wear safety goggles, as there is combat archery in most of the scenarios. 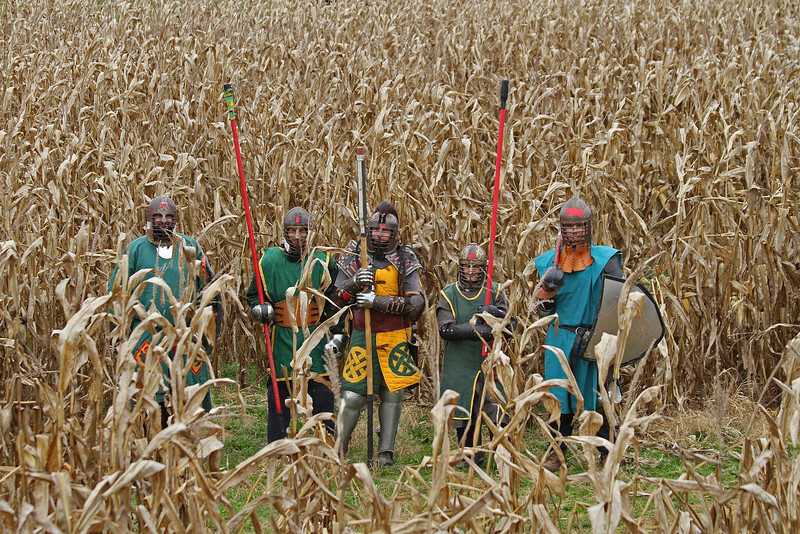 “The second year, we added fencing, and only fought heavy in the maze during the evening. Again, we migrated to whatever wacky scenario I could come up with. Bearing in mind I had a year to plot, I did get very creative, and that is how we ended up where we are now. 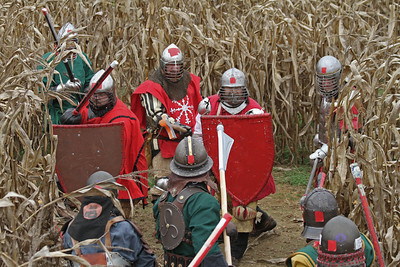 The Corn Maze war is in no way, shape or form high medievalism; it is about having a good time. We fight pretty much all day and most of the night, with fighters taking a break as they feel like it. I run one scenario after another with only a brief break for dinner. The autocrat is HRH Timothy of Arindale. The event page can be found here. Please make checks out to SCA Inc, shire of Abhainn Ciach Ghlais.